Spar Torpedo Boats were invented during the American Civil War and saw some success. Famous spar carrying vessels include the Confederate Davids, H.L. Hunley and the Confederate Ironclad CSS Richmond. Spar torpedo boats would travel under the cover of darkness, seek out its target, at some distance lower the spar torpedo and ram the opponent at full speed. A highly dangerous business for attackers and intended victims alike. The Union Navy quickly realized the importance of blockading the southern ports. Likewise, the Confederates were desperate to trade tobacco and cotton for food and arms. Realizing they never could challenge the Union Navy one-on-one, the South turned desperation into innovation. This is largely how they brought ideas like coastal ironclads, submarines and torpedo boats into reality. The CSS David was the first purpose built torpedo boat in the world. She was built like a barrel and looked a lot like a cigar with a narrow platform and chimney on top. She was 50' long by 5'6" diameter. 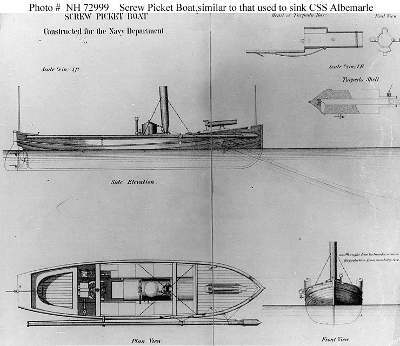 One of the most famous spar torpedo attacks is that of the Union steam launch "Picket Boat No.1" sinking the Confederate ironclad CSS Albemarle the night between the 27 and 28 October 1864. Other Civil War vessels that carried spar torpedoes include the H.L. Hunley. The Hunley sank the Union warship, USS Housatonic. The victory came with a bitter taste, as the Hunley herself failed to return after the mission. Some Confederate ironclads built towards the end of the war were designed to carry spar torpedoes in place of a ram. The CSS Richmond is a good example. Pictures can be seen at the Confederate Ironclads page. As the news of the destruction caused by such small crafts spread, just about all navies procured their own spar torpedo flotillas. It was short lived however. With the introduction of the self propelled torpedo the idea of a manned vessel with a bomb attached seemed ancient. By the late 1880's most navies had switched to Steam Torpedo Boats. Although, some lasted longer. As an example, the last Danish spar torpedo boat was finally stricken in 1919. S.M. Torpedoboot "No. 1" (1879) - The Imperial German Navy's first torpedo boat. The plan set consist of two sheets in 1:25 scale (details in 1:12.5). I have a copy of this plan. It is superb. An RC model could be made from these plans. MM1333 - CSS David, Confederate Torpedo Boat built in 1863 - 1:24 scale drawn by David Metcalf.